At 32-years-old, small forward of the New York Knicks and NBA star, Carmelo Anthony, is already a veteran of the game. While the basketball player is caught up in a feud with Knicks’ president Phil Jackson, Melo has repeatedly said that he wants to stay on the team. Drama aside, Carmelo Anthony has an impressive number of achievements under his belt. Even though an NBA championship ring has eluded him thus far, he has won three Olympic gold medals and one bronze medal. Carmelo Anthony has also been an NBA All-Star player nine times and USA Basketball Male Athlete of the Year three times. With a salary of $24.56 million, Melo puts his money to good use by continually giving back to the community through his Carmelo Anthony Foundation. This has included multi-million dollar projects in his hometown of Baltimore, Maryland and Syracuse, New York. In addition to his basketball career and philanthropic work, Carmelo Anthony is also an entrepreneur. Among other projects, he has put his love of luxury watches front and center by investing in and co-founding the magazine, Haute Time. It is his passion for fine timepieces that has naturally caught our attention. And within his impressive collection of watches that include Richard Mille, Patek Philippe, Audemars Piguet, and some very cool Rolex watches too. Let’s take a look. Carmelo Anthony has not one, but at least two Rolex Sky-Dweller in his personal watch collection. The Sky-Dweller is the newest collection from Rolex and is positioned as the ultimate luxury watch for avid travelers. Boasting 14 patents, it’s also one of the more complex Rolex watches out there. The automatic in-house 9001 movement drives the dual time zone displays, annual calendar, and month indicator functions. Interestingly, the aptly dubbed Ring Command Bezel controls the trio of functions. 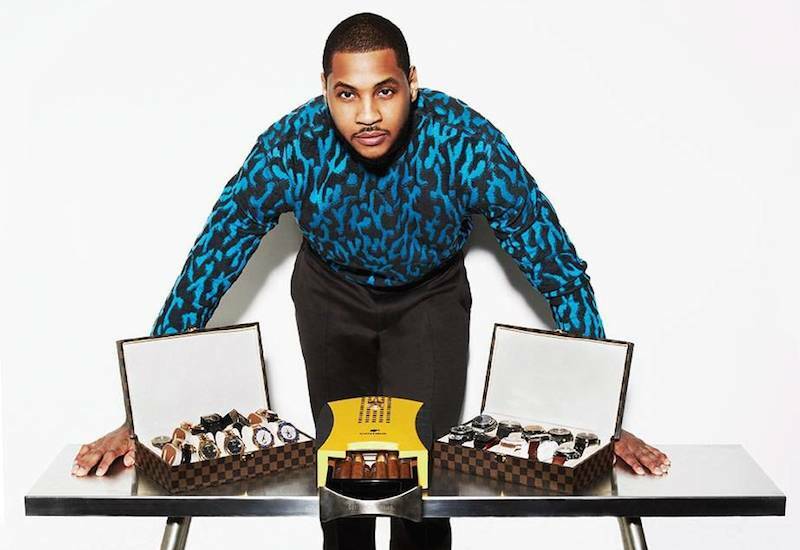 Towering at 6’8’’, it makes perfect sense that Melo chose the Sky-Dweller for its robust 42mm case. His two Sky-Dwellers of choice are the 18k white gold version with the black leather strap (ref. 326139) and the 18k yellow gold model with the brown leather strap (ref.326138). Yet another large Rolex model that belongs to Melo is the even bigger Yacht-Master II. At 44mm, this is certainly one of Rolex’s largest models. Built specifically for yachtsmen, the Yacht-Master II is equipped with a regatta timer. While this a very niche complication that will probably never be used by an average wearer, the technical sophistication of the movement is still one that should be admired. The self-winding Caliber 4161 includes a patented programmable countdown with a mechanical memory. Again, the bezel is the Rolex Ring Command Bezel which controls the countdown function. Carmelo Anthony’s pair of Yacht-Master II watches include the 18k yellow gold model and the stainless steel version. Both models include the bright blue Cerachrom ceramic bezel–a material that is both scratch and fade resistant. Additionally, both of his Yacht-Master II models have the same dial layout with a white background, blue hands, triangular red countdown hand, and red seconds hand. Besides his Yacht-Master II and Sky-Dweller watches, both of which are very complex timepieces, it’s hard to miss the duo of Rolex Day-Date timepieces sitting in Melo’s watch box. A symbol of achievement, success, and prestige, no high-end timepiece collection is complete without one—or two in Carmelo Anthony’s case. Not only is Carmelo Anthony a basketball star, but he is also a leader in philanthropy and in business. His dedication extends beyond the court. For us, it is also his appreciation of the technological achievements of horology that makes him an even more compelling figure to watch. Among his Rolex watches, which do you prefer? The Yacht-Master II, the Sky-Dweller, or the Day-Date?